No matter what industry you work in we have flat pallets to cater for all your storage and distribution needs. We design and supply an extensive range of pallets with a host of design features depending on the material or product you are storing or transporting. Many of our new products can be manufactured to suit your exact needs, specifications and dimensions and are built using strong, hard wearing materials to withstand the demands of today’s workplace. Timber pallets are the most commonly used pallet and we offer a wide variety of options. From single trip disposable wooden pallets to stronger and more durable heavy duty timber pallets, including two-way or four-way entry, winged, light to heavy duty timber frames and enclosed or open bottom, all at affordable prices. We can also build stackable timber pallet collars to give extra protection to the load. A more sustainable option is the plastic pallet, which can be easily cleaned and lasts longer. 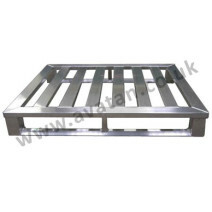 Stainless steel pallets are designed for more specialist industries where hygiene is of utmost importance. Aluminium pallets, also manufactured for food and pharmaceutical environments, are a lighter weight alternative to stainless steel, while still offering a durable, easy-to-clean pallet for hygiene controlled areas. 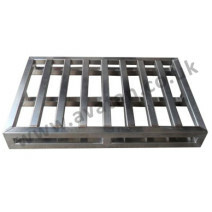 Our steel pallets are more economical and may be built to withstand heavy duty applications. Finished in a choice of paint colours, these may alternatively be hot dip galvanised, suitable for most internal or external storage needs. 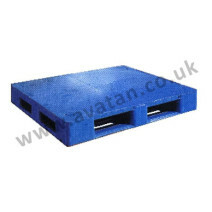 Each type of metal pallet can be tailored for you to include a range of design features, including sheeted or slatted top, fully reversible or single sided with conventional stacking feet, raised lips to reduce the likelihood of the product slipping, two-way or four-way entry for fork lift trucks and hand pallet jacks. 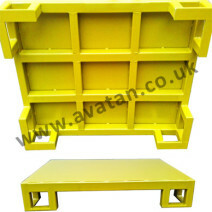 When not in use these pallets can be stacked empty to maximise the space in your warehouse. 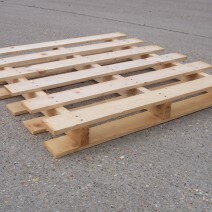 We also supply used flat pallets when available, which offer a less expensive alternative. Rental may also be an option dependent on requirements and availability. We have been making bespoke warehouse storage solutions for over 25 years and pride ourselves on our high manufacturing standards that stand up to the daily demands of industrial and commercial environments. For more information about our flat pallets range and to discuss your requirements, please contact one of our specialists today.